To me this looked very forced. My opinion is to continue trying to develop him, but knowing that will come with som costs. In my opinion he is not properly schooled. He does not have the basics and that is why he is difficult for others to partner up with. They don’t know how he will act, what he is about to do, or if he will cover for them. He goes on adventourius tours when he shouldn’t, he often misses the offside line, and so on. Then he has many good qualities as well, and I think he can be great if he gets the basics. Literally none of those are from this season. Or last. He aint a DM at all! DM requires a lot of footballing intelligence. You need to be able to read the game from the back of the pitch and intercept threats as they are incoming. Bailly is definitely not a DM. CB is his best position. You opinion on any other CB is like reading others opinion on Smalling. You don't have to go 2 seasons back to watch his good performance. Liverpool game is from last season. Most of his good work is in season 1 but it's still enough to persist with it another season imo. A bad run of form/loss of confidence is very possible. Smalling is arguably our best CB this season. Statistically even our best overall player in the champions league. Bailly is the opposite. Our lowest rated CB in the league by a distance and our 2nd lowest rated CB in the champions league ahead of Rojo. Last season Bailly was only ahead of Rojo and Lindelof. I didnt say he is better than Smalling and using Whoscored rating . Mustafi will be up there with the best when his thread is renamed as fraud fraud on Arsenal forum. Mustafi is always making mistakes, like Bailly. Smalling makes the least of our CBs. According their rating, Mustafi was the best CB in the league last season, even his Mother won't agree with that. In any case, no one said Bailly is better than Smalling, so you can stop getting defensive. Whoscored ratings are a poor way of measuring performances. Better to watch the matches. Smalling has been good since the comeback from injury but before the injury, he was well his normal standard imo. All together a good season so far, but not fantastic. Last season was better. However we have started to see a great partnership grow between him and Lindelof, and I expect (hope) that at the end of the season we will say that United have the best CB pair in the league. High expectations but there is the potential. When it comes Bailly I don’t expect he will get a continuous session of matches unless there are plenty of injuries. Solskjaer will keep Smalling Lindelof as number one and play the other here and there or if there is an injury. Correct. Mustafi's mistakes arent taken into account on whoscored, at least not properly. I believe that if a player's mistake results in a goal their rating goes down, but if the team gets away with it I dont believe thats the case. Like every other CB Mustafi's rating represents his workrate and what he does over the course of a match. Neither are Bailly's mistakes considered though. So he's even worse than his stats suggest just like Mustafi is, because Bailly is error prone just like Mustafi is. 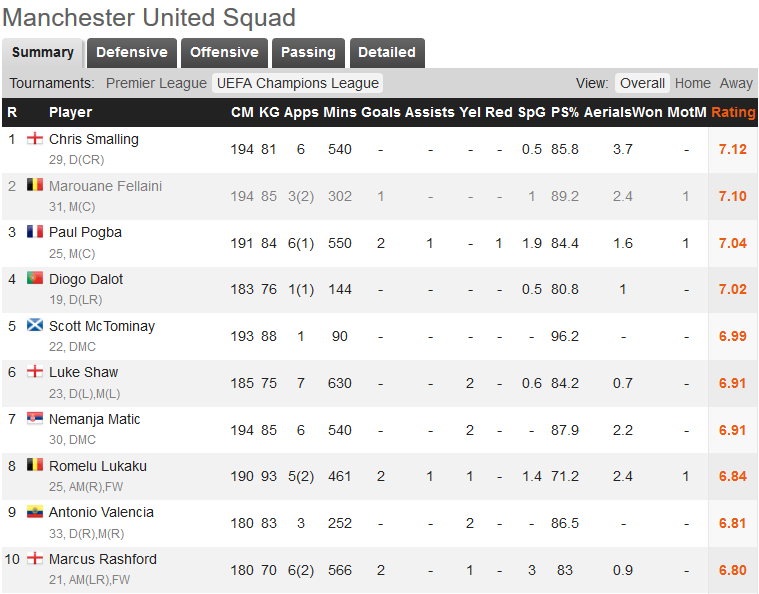 Smalling makes the least mistakes so theres no question of his statistical rating. Players who do a lot of good stuff but ruin it with a lapse in concetration allowing the opponents to often have a chance to score a goal can indeed end up with better statistical ratings. We've seen that with Bailly in his first season when he still made rash challenges, overagressive chanllenges and a lack of composure with his clearances being sliced and up in the air instead of away. We've seen it with Jones. We've seen it with Rojo. They've all had seasons where they ranked highly statistically compared to their peers. But all of them have shown themselves to be error prone which ruins a lot of their good work. The difference between now and Bailly's first season is, he also made a lot of tackles and interceptions compared to the other CBs in the league. He was a workrate player. And even this season and last there are some metrics where he wins the ball a lot still, because he's such an aggressive player. But he makes mistakes lots of them. So he's even worse than the stats suggest because we dont have a stat counting how many times he makes a poor choice in defense that allows the other team a shot. If anyone actually started counting that stat, players like Mustafi and Bailly would be rated a lot lower. 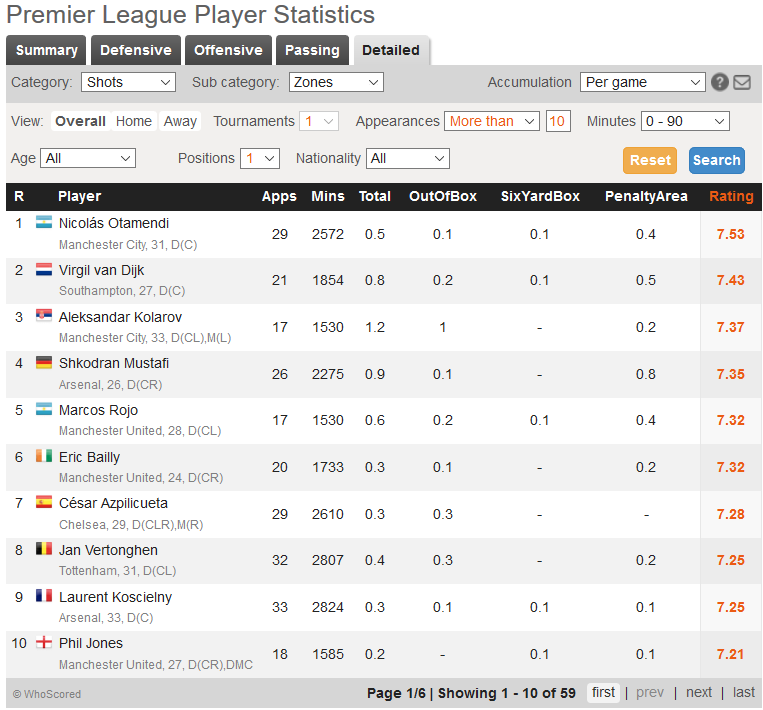 Whoscored only takes 'direct errors' into account I think. Bailly's double mistake for the goal we conceded against PSG does not count for example, but Kehrer's and Buffon's for Lukaku's goals do. Yep. See, thats where you have to take into account what you're seeing yourself. Personally I watch every game and have a big focus on how we defend. I even like when other teams attack us and they're pretty good, because I like to see our team defend well so that I know what we're capable of. I prefer that to matches where our opposition play poorly and are never really in the match and we just crush them, because that often tells you very little about what your team is capable of defensively. So, I'm looking at who is culpable for chances on goal when I watch us play. I'm looking for who could or should be doing better. Bailly, Rojo and Jones have earned a reputation for messing up. Lindelof less so but hes been here shorter and was still often beaten to the ball last season and at the start of this season. Meanwhile Smalling is quite dependable not to give scoring chances away. He's human and he's not the best CB in the world so of course there are occasionally chances where he moght have done better. But on average he's the one we can count on. So if you keep that in mind and then look at him having the highest rating of our players in the champions league this season, and the highest of our CBs in the league. And if you want to go and look closer and see which stats he's ahead on to make him have an overall rating thats higher than our other CBs, the combination of what you're watching and what the stats tell you that its easy to overlook (eyes play tricks and more often than not will just feed your agenda going in) thats where you can come to a good conclusion, using whoscored's range of stats rather than looking at just 2 or 3 specific stats. was the reason I still rated Smalling higher that season than Bailly, Rojo and Jones. Because of them making more mistakes. Despite them having more workrate and therefore a higher rating statistically. The game style of a player will be reflected in the scores. A defender with good positioning who totally erases the attackers wouldn’t get good ratings but someone who is poor at marking but good at saving it with a block or tackle gets good ratings, just as the ones that win lots of aerials. I sometimes look at the scores during a game and for some players it reflect the performance but for others it’s not even close. Or is seriously Jones ahead of him at CB and RB? Future is bright. Jones is better than him so of course he should be ahead. Scored for the Ivory Coast, whilst wearing the number 9. Sadly, he also suffered a clash of heads with teammates checking that he hadn’t swallowed his tongue as a result. Thankfully he walked off the pitch after this. What position was he playing? He was playing as a CB, scored the header from a corner. Took it very well. Earlier, had one of his typical lapses in concentration that should have resulted in a goal for Rwanda. Just wondered why he was 9! Saw the goal. Very nicely taken. That's just how Eric rolls. The challenge for ole will be to get him in form before Barcelona game. Where do you want to play him? I don't see what he can provide for us against Barcelona in the CL that is worth gambling on? Maybe a loan to Barcelona and hope hes picked? Need a competition for places between him and smalling to be honest for the reminder of the season, and a strong one. The best in form plays that game vs Barcelona. With smalling the whole backline drops very deep and passing from the back struggles as well and the midfielders need to drop deep to collect the ball which reduces our attacking threat. With bailly it's little better in backline in terms of positioning on the pitch. The team can play a lot more on the front foot in that case. Also if we ever need to deploy a wingback system he needs to be 3rd cb than young. Why on earth would Smalling playing mean our backline drops deep? Against Wolves both our fullbacks average position was pushed beyond the halfway line. Then Smalling and Lindelof was deepest. This had absolutely nothing to do with Smalling playing, it was because Lindelof wanted to give himself a head start on runs behind himself because he's not as fast as Smalling. If he could find some form that would be great. I do not agree with much else of the things you said. Should not play against Barca. Unlike wolves, who parks the bus and is very good on counter attacks, Barcelona is totally the opposite, they play on the front foot and dominate the ball. Surely they will work on our weakness and force us to drop very deep with clever movement from Suarez with messi on the ball in spaces between midfield and defense, and I expect whole line to drop deepest as smalling is not good enough to sense danger proactively and intercept, he is going to stick to his strengths of blocking shots, while as we struggle to build attacks from the deep with him this will be barcelona's game plan to minimize the threat of our attacks and control counter attacks, and they don't make as many mistakes as psg under pressure. I think bailly on top form is much better with sensing danger early and interception some passes unless those concentration lapses he has when he is not on top form. He was very good vs psg bar one moment where he failed to cut across a fast grounded cross. With bailly I feel our defense can push forward at times and we play a lot better and create a lot better from the back. Of course bailly has to be on top form coming into that game or it won't work. We will drop deep no matter who we play at CB because Barcelona will dominate the ball. And we'll be displaying our defensive action and trying to break on them. So it has nothing to do with Bailly or Smalling whatsoever. If we had VVD and Koulibaly at CB we'd still do the same thing. Smalling was the joint 2nd highest ball interceptor last season for a CB, exactly equal with Bailly. However Smalling averaged over 2 interceptions per game for over double the amount of games Bailly did. Smalling also made 3 interceptions in an extremely high level performance against PSG where he kept MBappe quiet and dealt with his pace. So what you said makes no sense whatsoever. Smalling is our best at reading the game and taking up the right position, not just for himself but often to cover other players. 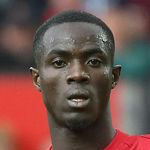 Bailly is error prone, gets himself into poor positions, makes rash challenges and sliced clearances because he has no composure in his defending, its all action all the time and he's also prone to putting more force on challenges than is needed, so when he gets it wrong it can look dangerous and risk being in trouble with the referee. So basically everything other than running straight at the ball and diving at it is something that Bailly needs to work on. I don’t see how Bailly would be picked to play for the Barcelona match. His weaknesses are poor awareness, positioning and judgement. Plus he makes many mistakes. Even if would be in great form and if Smalling or Lindelof was not, I would still prefer a poor performing Smalling or Lindelof. I know it probably doesn't make a whole lot of sense in regards to our own squad situation, but a loan move away from United to say Everton or something would probably be benefitting for him and his development. He is still fairly young and while it is doubtful he'll make it here, he still has a outside chance and if anything it might be a way for us to up his value some, if we are looking to sell him anyway. Realistically he could impress people for a mid table club to secure a move to Spurs or something for a lot of money and still not be good enough for us. Join this experiment: watch this video (or the 2019 edition for that matter) and imagine that the video caption is "Koulibaly - 2018"
This guy is gone isn't it? Wreked himself on international duty again. but i hope he was the one to replace luke shaw in 3 man defense against Barcelona as rojo would be a disaster. Can someone explain what has happened with him? When he first came, he looked our best CB with the right attributes however after some injuries is not even in the first team squads? Surely he can't be that bad?